the high point of the day: 4930 m.
Today was one of those days I had been apprehensive about since signing up for the trip. The reason? The gain in altitude from one campsite to the next. 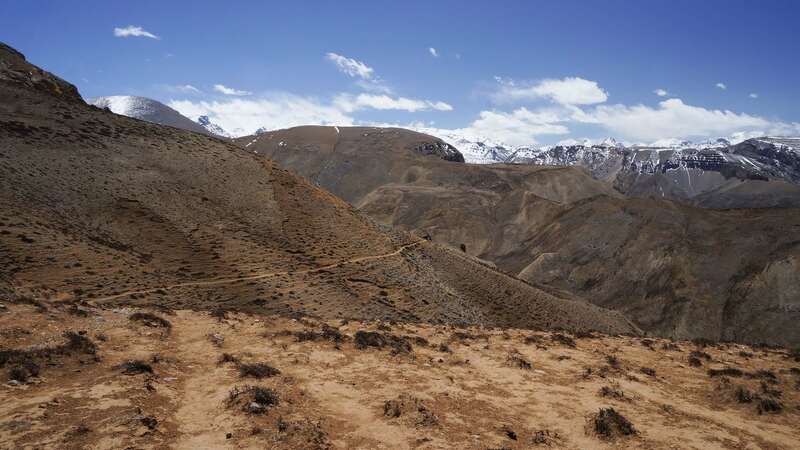 With the Luri Gompa site at about 3840 meters, the one at Ghuma Thanti represented an increase of 910 meters to 4750, definitely beyond the oft-mentioned 300 meters a day guideline for ascending at altitude. 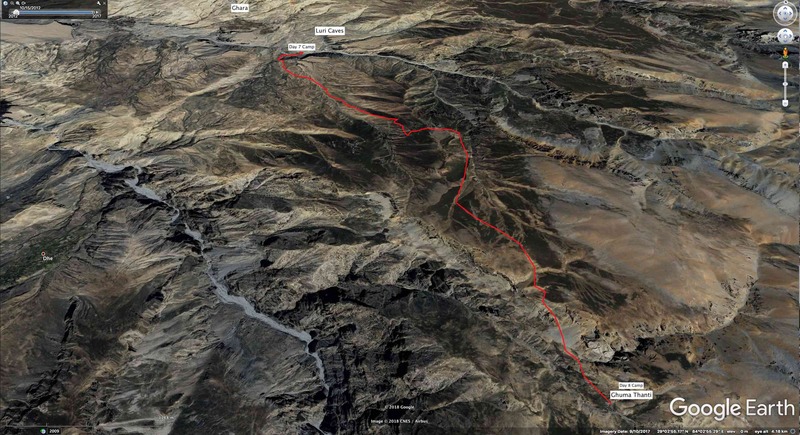 The logistical problem is this – there is no good intermediate spot to camp that would make the altitude gain for the day less drastic. 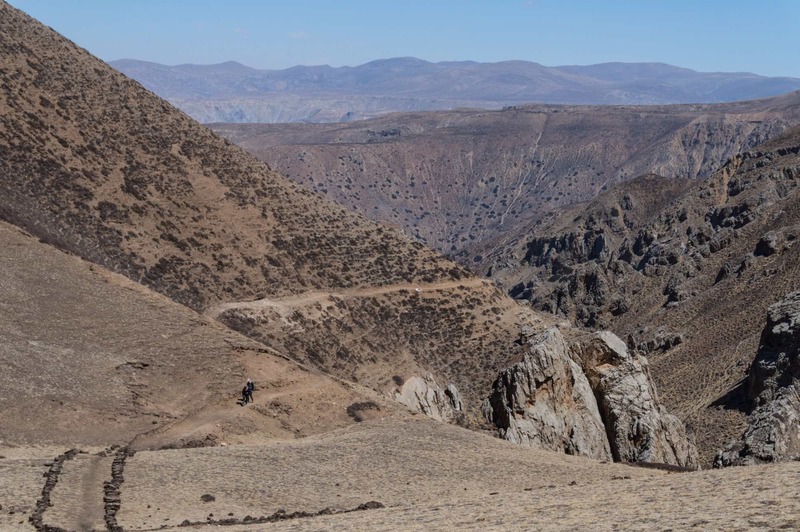 All the other trekking agency itineraries I looked at had the same sequence of campsites. Our trip itinerary did make the problem seem less of an issue by fudging the numbers a bit. 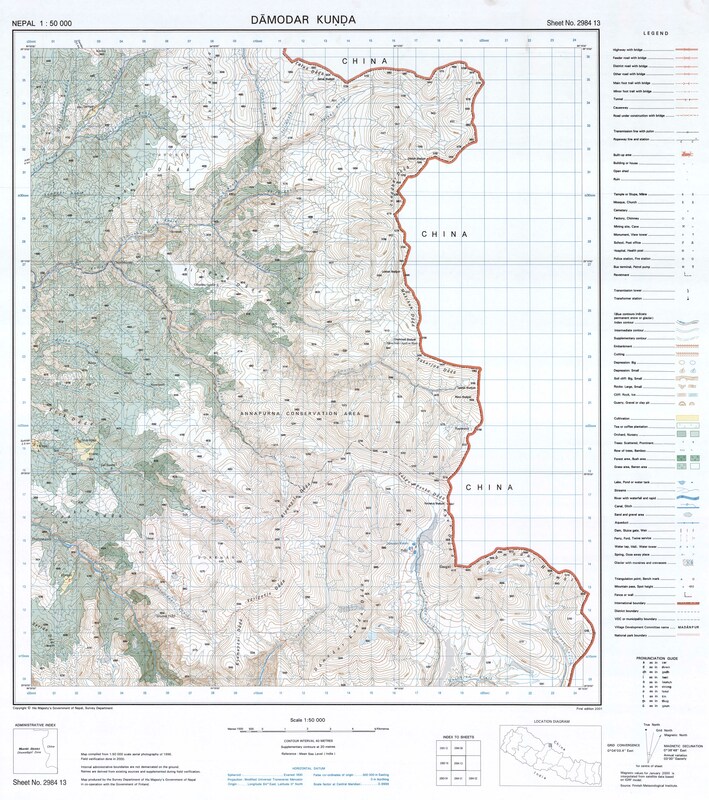 The decision was made to combine two trekking days, eliminating one camp. Thus we ascended more than 1100 meters in a single day, from 3600 m at Yara to 4745 m at the pilgrims’ shelter at Ghuma Thanti, crossing a 4900 m pass on this epic 9-hour day. We arrived at camp as the twilight gave way to a starry, cold night. By 9 PM the last of the porters finally arrived, completely shattered. The next day we continued over an unnamed 5300 meter pass and then down to the Bharche Khola (4900 m) where we set up our second camp. After a cold night (-12C) we were anticipating the tough hike over the Damodar Kund Ridge and a 5500 m pass before descending down to the sacred lake of Damodar Kund (4890m). Then an emergency medical situation arose with one of the camp porters in the early hours of the morning. Suffering from pulmonary edema, three times he had to be revived when his heart stopped. After calling in a helicopter with our sat phone and fashioning a makeshift stretcher, he was carried up to a nearby plateau where the chopper arrived to take him and another porter to Kathmandu for treatment. 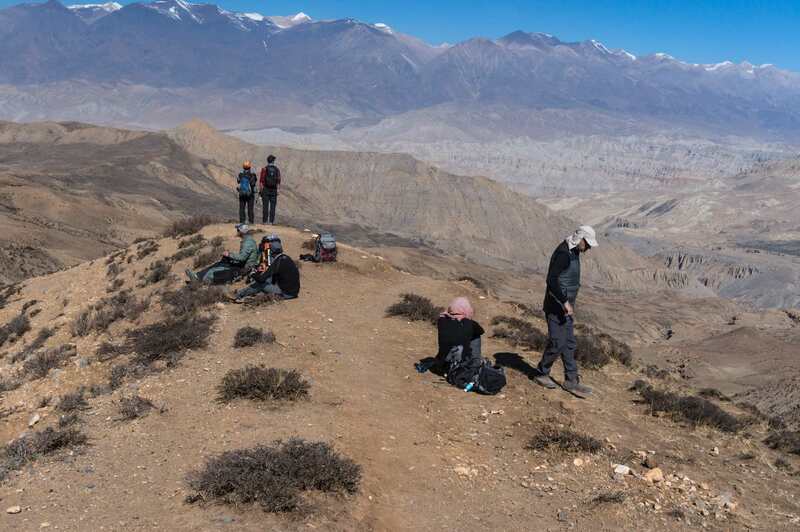 (Eventually we heard that both porters had fully recovered). The cold nights, combined with the near death of one of their friends, spooked some of the other porters, who refused to continue the trip. The decision was made to spend a second night at the Barche Khola before retracing most of our steps back to Kagbeni where Jeeps would take us to Jomson for the dramatic flight back to Pokhara. It would take a week to get back to Jomson, a disappointing, though understandable, conclusion to our trip. We walked down to the river bed and crossed over to the other side. Then the uphill work began – slowly, slowly following the switchbacks as they made their way up. 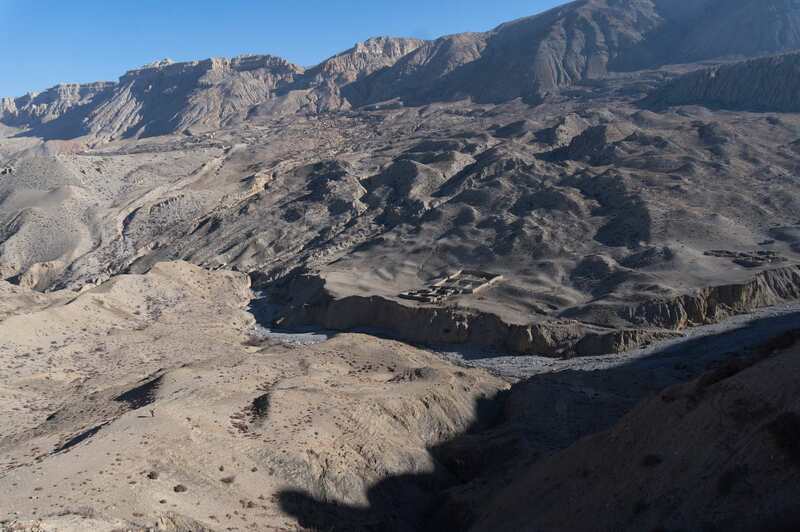 The images above and below – one with people and one without but essentially the same perspective – show the uphill with a view of the campsite we had just left with Ghara higher above. Here is a Google-derived satellite view of the topography we were crossing this day. [Note: the route is my best estimate. It is a bit off. If you take a look at Google Earth you can see some of the trails.] Average altitude was in the mid to high 4000’s with a 4930-meter pass in there somewhere. The terrain is fairly desolate with scrub being the only vegetation. Missing from all of my shots of the day is one of the supposed 4900+ m passes we crossed! I remember thinking – “You mean this is it?” The usual prayer flags and rock cairn were not there to highlight the fact. The pass may be the reason why we all stopped in the image below! We had been on the move for a couple of hours by this time. Looking back, looking ahead – in each case, the trail scratched out of the mountains of sand. Easy to see on clear sunny days like this – but add a snowstorm and it would become a challenge, even with the occasional cairn that marks the way. The Yara villagers have done some work on the trail in this section to make the path more clear for the hoped-for pilgrim tourists. 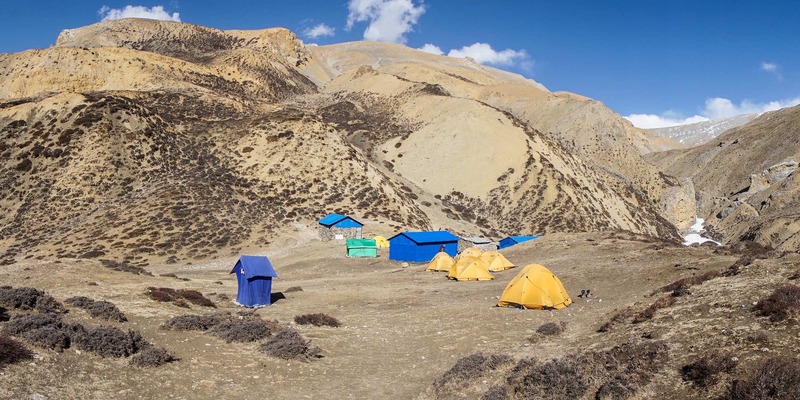 And finally – it was noon and we had been on the move at a moderate pace since shortly after 7:00, there was the blue-coloured corrugated tin sheeting of the Ghuma Thanti pilgrim shelters. It would take us another hour to descend down to the flat area where they were located. Ghuma Thanti is a stop on the Hindu pilgrims’ trail to the Damodar Kunda, the eyedrop- sized “lakes” that we would reach in a couple of days. 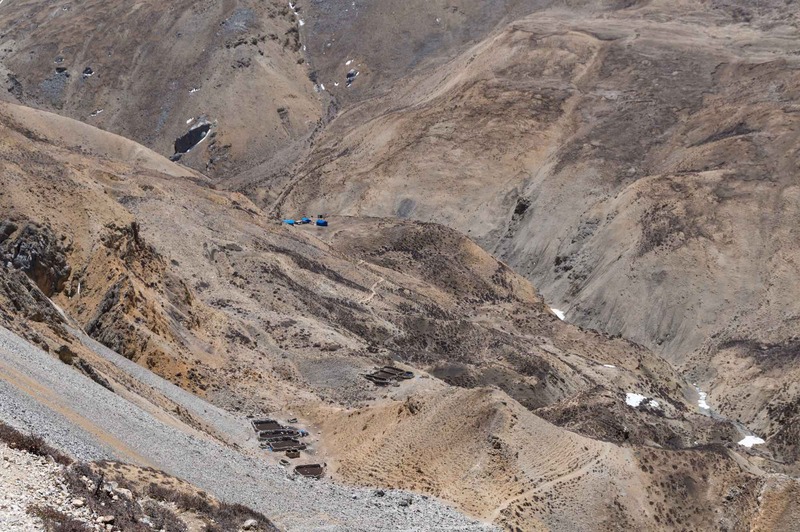 The blue shelters you see have been put there for the use of those hardy Hindu and Buddhist pilgrims. This is not the Camino de Santiago! 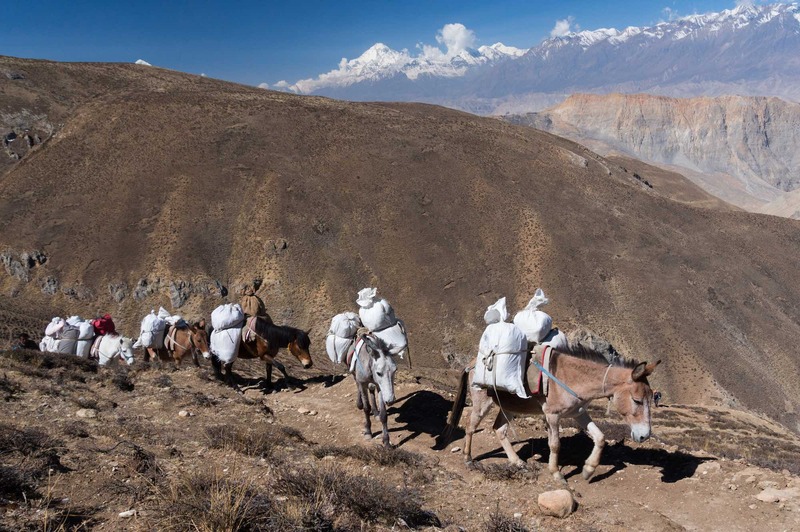 Arriving in Yara from Jomsom, they will often hire a guide and a donkey and go on to Damodar Kunda from there. That is my tent in the foreground on the right. My boots are sitting out in the sun. Not yet visible is a helicopter landing sign that was placed later that afternoon on a place spot not far from my tent! Shortly after we had set up camp another trekking party arrived. It was made up of a guide, a cook, and a couple of porters, and one lone client! 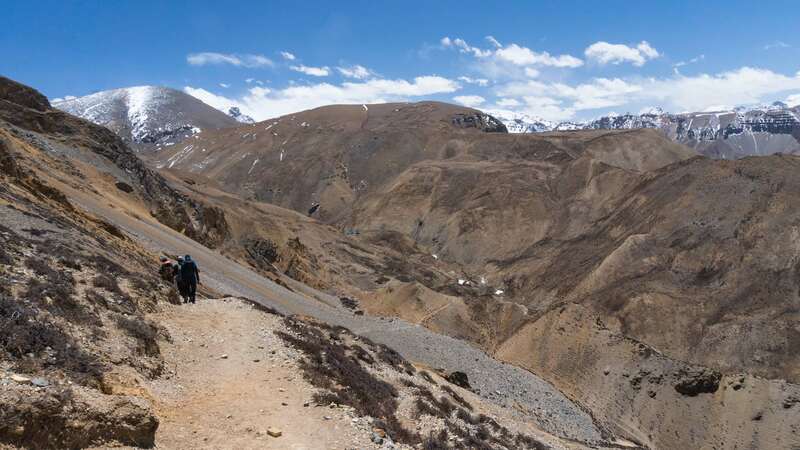 They were on their way back to Jomsom from the Japanese Camp at the bottom of the Khumjungar Glacier, having decided to abort their planned ascent of Saribung Peak. And now the client, a woman in her late 30’s, having done the return walk from the glacier back to Ghuma Thanti, decided she would just helicopter out from here to Jomsom. The guide called Kathmandu for a helicopter and set up the landing marker just to the right of my tent in the photo above. 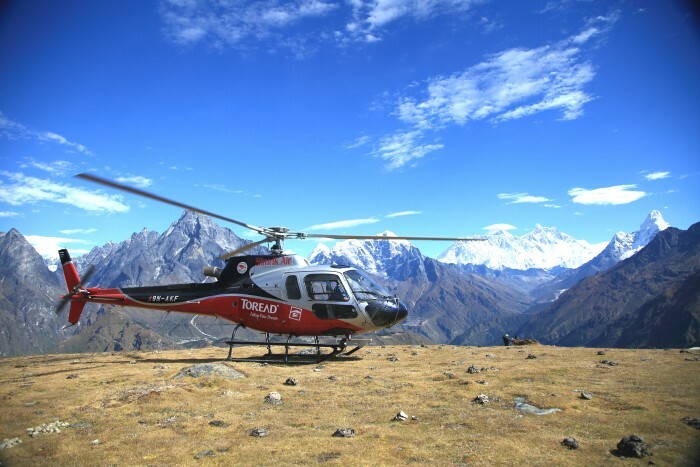 an internet-sourced image of a helicopter landing in the Himalayas! See here for the source. I stood there and waited with her for the helicopter. Eventually, I invited her to our dining tent and out of the sun for a cup of tea and some biscuits and got the whole story of her ill-fated trek. As for the helicopter – it would not arrive that day after all. After making it to Pokhara it was decided that it was too windy to consider further progress so its arrival was postponed until the next morning. 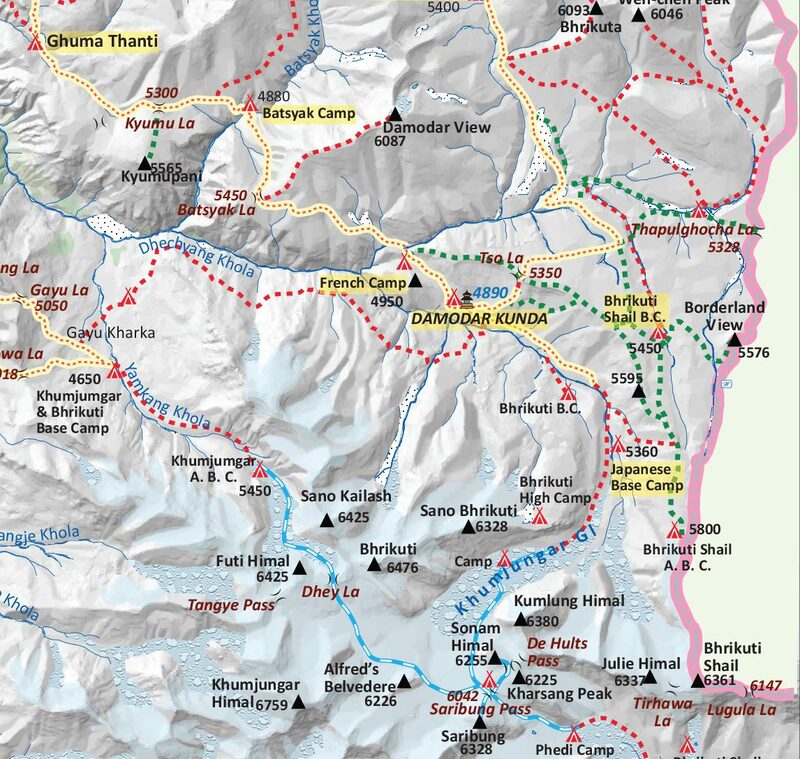 From Pokhara, it would fly up the Kali Gandaki valley and then follow the Dhechyang Khola to Ghuma Thanti. The guide, of course, would also hop in for the ride back. Not clear is what happened to the other members of the crew. We were on high up of a ridge on the south the next morning when we heard the distant sound of a helicopter. As for why they were not going to Saribung Peak, it did not sound quite right. 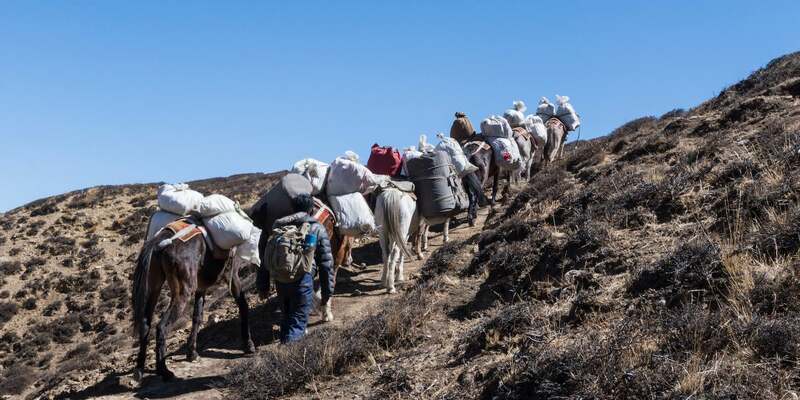 Apparently, she spent a day at Japanese Base Camp at 5250 meters at one end of the glacier while her guide, who is said to have summited Everest three times, checked out the route up the Khumjungar moraine to Saribung La. On his return, he told her that it was impassable because of crevasses. Our experience three days later had us wondering what he was talking about, since we got to the pass – Saribung La – with little drama. Her very difficult return walk from Japanese Base Camp to Damodar Kunda to Batsyak Camp to Ghuma Thanti had not been made easier by her disappointment in failing to summit a peak she had focussed on for months. 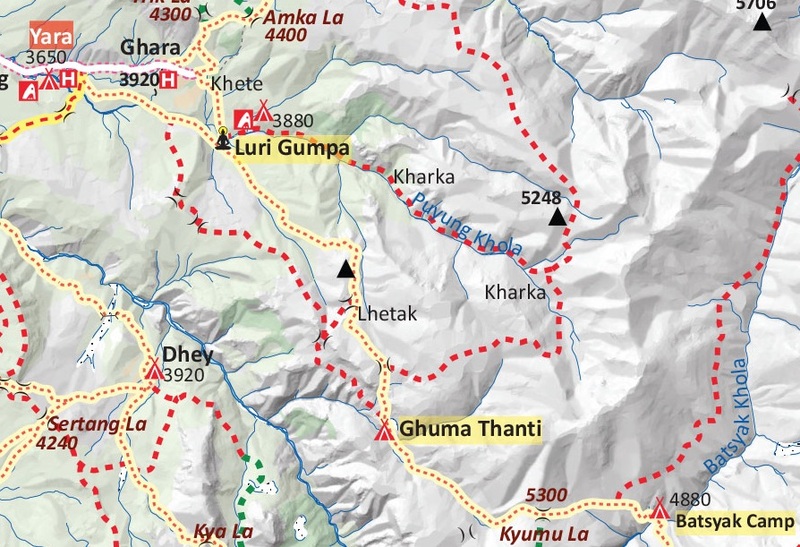 The map below shows the route from Ghuma Thanti to the Japanese Base Camp at the bottom of Khumjungar Glacier and then what would have been her glacier approach to Saribung La and Saribung Peak. Another thing she mentioned had me wondering if the guide(s) were just looking for a polite way to get her to abandon her trek/climb. 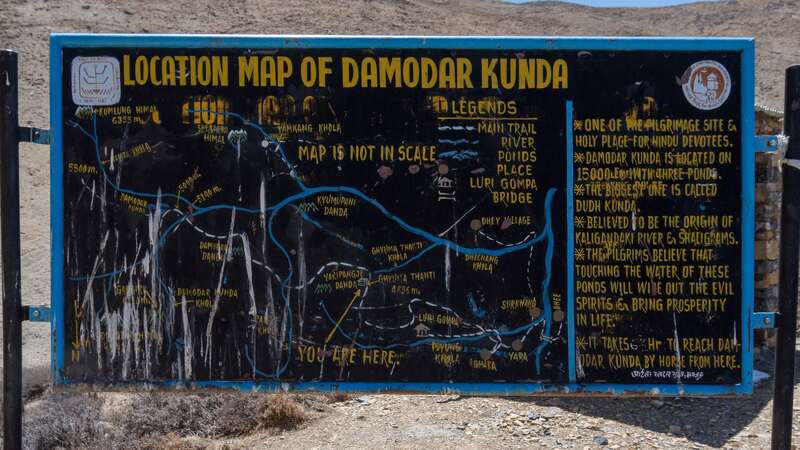 She told us of the ten hours it took her to get from Japanese Base Camp back to the Damodar Kunda, a stretch which took us maybe three hours to do. 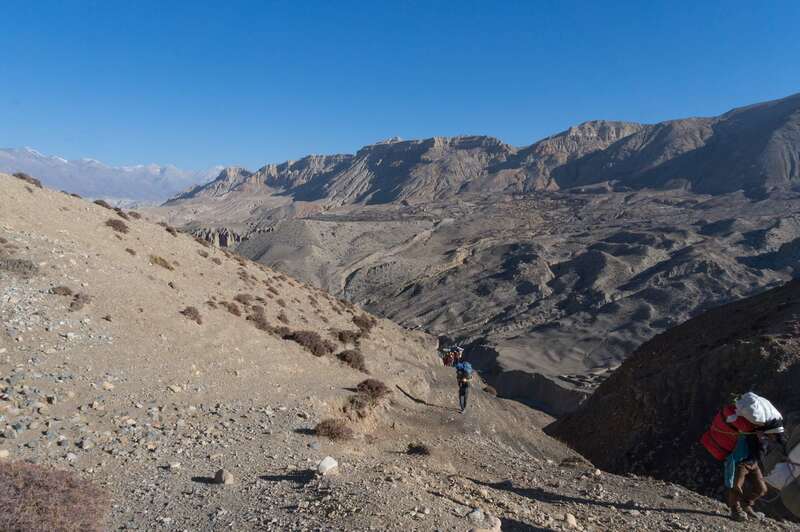 She may have been so slow – and/or not fit enough – that the guide doubted she could manage the long ascent up the lateral moraine on the west side of the Khumjungar Glacier and then the ascent up to the Saribung pass at 6040 meters, let alone the additional 300 meters of vertical gain to stand on Saribung Peak. The helicopter would arrive the next morning after we left Ghuma Thanti. We heard it from the hills above as it made its approach to the landing spot near where our tents had been.